A selection from Pepys’s startlingly vivid and candid diary. Originally written in code, Pepys’s diary includes his unforgettable eyewitness account of the 1666 Fire. The Great Bore of London - Samuel Pepys. 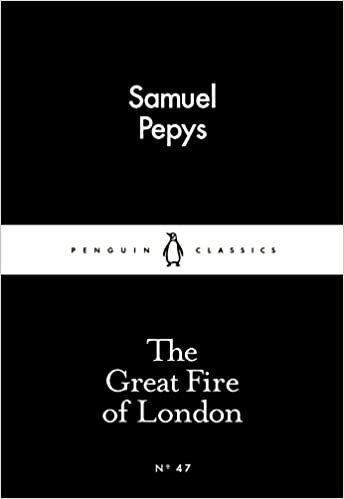 I have always been fascinated by the Great Fire, but this is the first time I’ve read Pepys account of it. A first-hand witness, it’s a shame his diary wasn’t a victim of the flames. His report was so dire, so full of tedious details, that my need for a startling version was quashed. I didn’t need to know who he had dinner with, nor did I delight in his soulless descriptions. Writing of the times, definitely, but it didn’t stop my apathy. The only exciting moment was when Pepys was transporting his treasured personal effects to safety and decided to bury some parmesan cheese out his pal’s back garden - a dullard, yes, but also a man after my own heart.